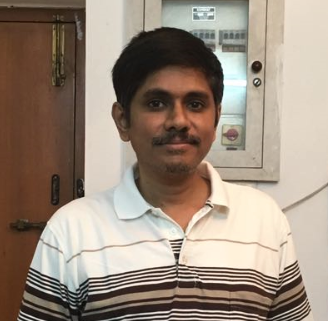 ﻿ About me (Viswanathan, author of Azhagi/Azhagi+). My views. தமிழில்: இப்பக்கத்தில் உள்ள நேர்காணலை நீங்கள் தமிழில் படிக்க விரும்பினால், இங்கே செல்லவும். உங்களுக்கு ஆங்கிலம் படிக்கத் தெரியுமானால், இப்பக்கத்தையும் படித்துவிடுமாறு கேட்டுக்கொள்கிறேன், உங்களுக்கு விருப்பம் இருப்பின். ஏனெனில், சில கூடுதல் விவரங்கள் இப்பக்கத்தில் உள்ளன. Note: The following is an English translation of an interview (in Tamil) given by me to 'Nilacharal.com' in 2004. I am 51, as of Nov 2018. With regard to this translation, please read this note and also these remarks, if you wish to, either before or after reading the following. In 2004, 'Azhagi' software possessed transliteration tools for Tamil language alone. Hence the queries in the interview do not talk about the other Indian languages. Firstly, a few excerpts below, from the abovementioned interview (which revolves in detail around me, my software, my views, etc.). The interview in full follows the excerpts. But, before you start reading all that, I wish to make it clear that God is Everything and I am Nothing. I am not even zero. I am just NOTHING. Of course, my software is significant, as it benefits those who use it. And also, I may leave this world this next second but even thereafter my software will live and benefit this society, at least for a few years. So, as always, I am nothing. Anyway, whatever the aforesaid statements of mine may mean to you, kindly go ahead (if at all you wish to) to read the following excerpts/interview so that it helps develop a better understanding/relationship between me and you (my users/wellwishers), in this world. I am grateful to God to have given me a dreadful disease and made that disease itself as "a stepping stone, a bridge, a boon" - to create 'Azhagi' software. But for that, my life would have merely gone along the lines of 'Also went to USA. Also settled in USA'. We have heard and read even when we were young that "beauty is not external; it is internal". But what we read and hear is all trivial. To realize it in life is something great. Only to honor the lovely heart of my wife who gave me the good fortune to realize "it", I christened my software as 'Azhagi'. All software have behind them several hours of untiring day-and-night work. ... .. . Many software involve massive expenditure to create them. The biggest help that you can do (not just to me but to the entire community of software developers) is to 'wholly' understand the software developers and the time/money/energy spent by them and being spent by them (in creating software). If you so understand it, you will yourself know what kind of support you should give. In our everyday life, let us keep ourselves as the limit to reach. Not Bill Gates or Abdul Kalam. On a daily basis, if we can improve and progress ourselves and try to attain absoluteness as a true human being, that itself is sufficient. At the end of our efforts, we will have realized that we are a 'limitless power'. With HER own growth potential, Mother Tamil has been giving away outstanding sons to the world of Tamil from time to time. It is a great honour for 'Nilacharal.com' to interview one such great son. Not only is Vishy (alias) Viswanathan a boon to the world of Tamil computing, the younger generation has a lot to learn from him. His mental strength, in the backdrop of his spiritual strength overcoming the challenges of time facing him, is quite amazing. This distinguished son of Mother Tamil, hails from a village called Kandamangalam in Thanjavur District, Tamil Nadu. As soon as he completed (in 1989) his graduation in engineering, he joined Bajaj Auto Ltd. which was followed by his entry into Tata Consultancy Services, immediately after completing his P.G. Diploma. While serving thus, he was afflicted by the disease called 'Colitis' as a result of which he was compelled to quit his employment. Undeterred by the disease for which he fell a victim under the wheel of time, he converted his hurdle stones into stepping stones and concentrated fully on the field of computing. He became a master in the software arena. 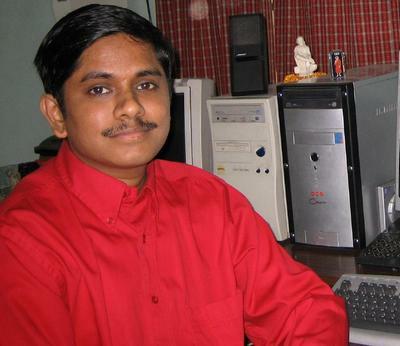 For the benefit of the Tamil community, he authored the Tamil software package called 'AZHAGI' (in 2000). He received the accolade 'The scientist of our city' from the Sun T.V. of Tamil Nadu. Almost all of the Tamil media have appreciated his work. Vishy, who very humbly attributes this growth of his to the Divine guidance, his wonderful wife's support and 'help and encouragement' from his friends is certainly a sterling gem for the world of Tamil! As ones who hang our heads in shame for the failure of the people of the past to foster and help the outstanding gem Bharathi, with the fond hope that the world Tamils of today will extend all the help to this highly skilled person so that with his skill the richness of Tamil and the younger generation's enthusiasm for learning Tamil will grow further, we are now presenting to you Vishy Viswanathan! Q. Your interest in Tamil has been there since your younger days or is it something which came into existence in the later years? Interest from my younger days, indeed. Not only interest, I had the drive also. I always (as far as I can remember, from 3rd standard onwards) stood first in Tamil. In many competitions – oratorical, essay, music, acting, etc. – I have won many prizes too. I can never ever forget my two Tamil Teachers – Sri. Jegadeesan (Chennai) and Poet Sri. Ko.Pe.Naa (Mettur). Just imagine, even after 20 years, I am maintaining my contacts with them! Q. Did you make a research in Tamil software to make use of your expertise in the computing field? Or, is it because of your love for Tamil, perceiving your research to serve as a step forward for Tamil language's growth? I should say it is a mixture of both. But I had the opportunity for that. Because, frankly speaking, I never thought that I would create a software on my own and that too for the development of Tamil. Like a "Blessing in disguise", I got "an opportunity" to create a software myself. I am happy that God willed that that particular opportunity should be used for the development of Tamil language. I am grateful to God Almighty to have given me a dreadful disease and made that disease itself as "a stepping stone, a bridge, a boon" - to create 'Azhagi' software. But for that, my life would have merely gone along the lines of 'Also went to USA. Also settled in USA'. Having evolved as a 'software architect' today (2004), when the product which I created myself as a sole individual gives immense benefit to an other individual and when that individual heartily appreciates and expresses his/her innermost love for the benefit derived, the "special feeling" I experience at those moments, only creators alone know that 'special feeling' fully. Words cannot express it otherwise. In just the same way as Jnanis (Gnanis) cannot fully describe their state. Q. Is there any background for you christening your Tamil software as 'Azhagi'? We have heard and read even when we were young that "beauty is not external; it is internal". But what we read and hear is all trivial. To realize it in life is something great. Only to honor the lovely heart of my wife who gave me the good fortune to realize "it", I christened my software as 'Azhagi'. Though this is the specific background, in general perception too, it happens to be a fitting name for my software. The emails I have received from many of the Azhagi users themselves could be quoted as testimonies for this. In this context, I would like to particularly mention that in Azhagi's core font's name 'SaiIndira', 'Indira' is my beloved Mother's name. Though many may be aware what 'Sai' refers to, generally it only stresses the broad view – Universal Love. Q. What kind of interest you have in Tamil literature? In my school days, when I was the literary club secretary (for both Tamil and English), I had read some literature. However, after my Engineering and P.G. Diploma, when I entered the software field in Bajaj Auto Ltd. and Tata Consultancy Services, I used to read only "Bharathi's poems and Thirukkural" occasionally. Otherwise, I have greater interest only in reading the life stories of the Jnanis. From the age of 14, I have had the skill of writing Tamil poems. Whenever time permits, even now I write poems. I also have now the contacts of a few who write beautiful poems in pure Tamil. I am enjoying those modern literature too. Q. Despite your ill health, you have enthusiastically authored rare Tamil software tools for use in computers, keeping the interest of the society in the forefront. What has been the motivating factor for this mental strength of yours? This alone helps one to work very hard. This is the only one which serves as the pillar for perseverance. There is a saying "Hard work ever pays". I doubt whether hard work will always yield results. From my own experience, what I have learnt for myself is : 'Hard work with perseverance ever pays'. 'Patience results in renown' is a well researched ancient saying. It is totally true. 4. Bharathi's wisdom song 'One should possess a resolute mind'. That too in Isaignani's music (the quietening effect which the melody songs of Isaignani give is really grand). I have sung alone this song countless times. 5. Unshakable positive mental attitude that 'we will be definitely successful'. Whatever is desired to be achieved should be visualized again and again and again from the very depths of the heart (This is very very powerful. Swami Vivekananda has spoken very highly of Visualisation). 7. Hope the very best but be prepared for the very worst too. This is absolutely necessary. Despite the strong faith that what we think will happen, when it does not happen, one should have the equanimity of mind to set it aside saying 'everything is for good' and be natural as ever. On the whole, if it should be put briefly, if we discharge our duties perfectly (efficiently, patiently) reposing total faith in God and by surrendering to HIM, it is enough. God knows what is destined to happen and when. There is no room at all for questions like “Why? What for?” in His abode. I am one to have personally experienced the supreme nature of the saying, “Do your duty. Do not expect results (fruits)”. I have been 'trying my level best' to act accordingly at all times. Q. What would you like to tell the world of Tamil computing which is continuously expecting many special achievements from you? To the extent you expect a lot from me, please give me more encouragement (in it's different dimensions), continuously. That is what is required. If that is present, that is enough. Nothing is difficult for anyone. Everything is possible. At one point of time, the severity of my disease was very high. It is extremely difficult for anyone to invent a unique software and to do the designing/coding/testing and website creation/enhancement, etc. – all alone, single-handedly. To do the same thing amidst an extremely severe disease and with ordinary computer/internet facilities is all the more difficult. Only the motivating emails and the 'love and affection' shown by the users were the great support at such times. I cannot forget them, life-long. All those emails have been archived. Many of the users have now become my family friends itself. To such loving users only shall go the first honours, for my software invented amidst such extreme difficulties to stand world-renowned now. Q. We learn that your wife is also a software engineer. Has her expertise also been of help to you? My wife's knowledge domain is different (she is a Oracle and Java certified Developer). Mine is different. So, there is no direct support. However, whenever I am engaged in designing the interface for my software and azhagi.com website, I used to seek her opinion. As a user, as a website visitor, she used to express her views on the interface's color, structure, etc. Other than that, her love, concern and patience alone have been of great help to me. Though she is now working in a renowned software company, the efforts that she had taken for that and the sacrifices she had made were many. She is basically a M.Sc graduate, not an engineer. Q. Although you have been introduced in many TV programs, we understand that Visu's 'Arattai Arangam' program conducted on last year's Independence Day has occupied an irreplaceable place in your mind. What would you wish to say about it? Although I thought about this several times, I am in a fix to know how I could reply in a mere five or ten sentences. I feel that I could as well write exclusively on this as an experience, at some point of time in the future. Let me say only one thing now. The youth of today shall not relent with a feeling that there is probably none to bring to light (on a large scale) something invented after a really arduous struggle. They shall ever bear in mind that Sri Visu, his team and 'Arattai Arangam' are there for them. Otherwise, my hearty thanks are always present for the loving hearts who have interviewed me so far from various magazines, radio and TV channels. Q. How is your health now? Do you wish to share anything about it with your well-wishers? My health has improved a lot, much better than before. It was very very worse. Compared to that, I should say I am much better. Diet restrictions also have been relaxed to some extent. However, I cannot go anywhere as I wish and eat as I wish. Generally, even within Chennai, I go out only when it is very important. To go out of Chennai is a rarity! My visit to Neyveli for 'Arattai Arangam' was the second instance of me going out of Chennai in the last 7 years! Prior to that in 2001, I had been to 'Vaitheeswaran Temple'. Q. What do you expect to be the shape of things to come for the Tamil computing world, for your inventions to attain a fullness? I feel that the Tamil computing world is moving very slowly. There are still many tasks that should take the form of a software. It is really a wonder why many language-enriching software in my imagination have not yet become realities despite the fact that there are many software companies which employ thousands of employees. It is my desire that all these software should ideally be there not only in Tamil but in all the world languages. If all these software can come out with elegance, loaded with features, extremely user-friendly in their operations, it would be a great and exceptional social service, at the global level. I have an unshakable faith that as computer technology grows by degrees, even translation software, voice-recognition software, text-to-speech software, etc. will definitely become a reality. But, if several people should be researching the same subject from different places, it is a monumental waste of time. If I ponder whether there is any other way out, I should only say from my experience that no such way seems to exist. Such is the state of affairs. Will this situation change? God only knows. Whatever it is, whosoever has been willed by God to do a particular task, only those will do that task. No one can change that. Whoever has invented a quality software, whoever is inventing one at this moment - my hearty prayers ever exist for them. Note: The following question and answer are available in Kannada and Hindi too - here. Q. The world of Tamil youth is today emulating your qualities of hard work, faith, love for God and achievement. What do you wish to tell the younger generation? If you think that I am an example for the youngsters, I am happy. I do not know whether I am fit enough to advise them. This is because I have many shortcomings. So I can share certain things that I have learnt in life. The ones which the youngsters find in agreement with their line of thinking, they can take them. One should be humble all the time and ever. Paul Brunton, the author of 'Search in Secret India' asked the great sage of Kanchi, "I should see God. Tell me just one easy way". The sage replied, "Be humble. That alone will do.". That is the strength of humility. Let us not blame anybody at any time for anything. "Good and bad happen to us, not by/from others" – so says our ancient Tamil literature. If someone does something good, appreciate that most heart………..ily. Do not give room for any hesitation (having many reasons in the mind). A single word of appreciation may become a turning point in one's life. 'Envy is the night soil of the mind' in the words of Sri Vairamuthu, as mailed to me once by the wife of my bosom friend. I don't think anyone has achieved anything through anger. We should not forget the path we treaded earlier. We should ever remember even the smallest help rendered to us by others. Is much bigger than the whole world. 9. Even as you grow (prosper), lay a path for others also to grow - as far as possible by you and without expecting anything in return. If not possible, make way. 10. Religion, Language, Country – let us not live in this constricted circle. Never ever. According to our Tamil literature, "every country is my own and all the people are my kinsmen". Think deeply. When the world came into being, all the three (Religion, Language, Country) were not there. Even when we were born we had not known all the three. So, let us live for ever with the broad outlook, 'Love All Serve All'. We are a mammoth power that has transcended religion, language and country. We are neither body nor mind. Great sages like Bhaghawan Sri Ramana Maharshi were those in that state only. In our everyday life, let us keep ourselves as the limit to reach. Not Bill Gates or Abdul Kalam. On a daily basis, if we can improve and progress ourselves and try to attain absoluteness as a true human being, that itself is sufficient. At the end of our efforts, we will have realized that we are a 'limitless power'. Naturally, a question may arise in your mind whether Viswanathan (myself) is following all the aforesaid things at all times. My reply for that is "NO". I am also a student when it comes to the lessons of life! Sometimes, I fail too miserably in following the aforesaid. But I "endeavour" to minimize the failures and avoid them. If we do our duties perfectly and follow all of the abovesaid at all times, will we also not become Jnanis? On the whole, to say briefly, should there be one 'eminent desire' to accomplish in life, it is to 'attain Jnana' only. One need not have barriers of age, period, time for the same. Q. For widening your research and inventions, what kind of support you expect from the world Tamil community? Azhagi is just a 'tip of the iceberg'. There are many more things to achieve. Besides, when I read and hear about the achievements made by others amongst manifold constraints (which are multifold larger than my own difficulties), I feel that I have not done anything at all. Hence, I do not have the mind to seek anything specially for me alone. So, I just place before you a few things. After reading them, whatever the readers would like to do, let them do. 1. All software (be it Tamil software or some other language software, free software or commercial software) have behind them several hours of untiring day-and-night work. There are many circumstantial reasons why a particular software is freeware and others are priced. But both are born out of hard work. Many software involve massive expenditure to create them. The biggest help that you can do (not just to me but to the entire community of software developers) is to "wholly" understand the software developers and the time/money/energy spent by them and being spent by them (in creating software). If you so understand it, you will yourself know what kind of support you should give. 2. There are still many exciting software (against those, Azhagi is a very very ordinary invention) about which the entire world will be wonderstruck but which can be certainly said to be confined to the four walls yet. Reasons for this are many - no need to elaborate and elucidate. They are all facts known to all. It is my desire that in the future there should be an "Inventors' Club" (in a big way, with many branches, all over the world) for such inventors, for helping them in every manner. Whichever wealthy NRI comes forward to start this, it would be a great bridge to many inventors. We only happen to hear the commencement of general welfare organizations, in a variety of new names, every day. Please understand that even for the inventors, the facilities needed by them in relation to their inventions are very many. Please imprint deeply and indelibly at the very bottom of your hearts that more the inventors acquire of such facilities, faster will be the creation of very many new inventions by them. 3. Please visit the website http://azhagi.com/jana*. In the limited time I have, I could make a website for this boy achiever alone. But achievers like him are very many. Who is to nurture all these achievers? Who is to tell about them to this world? Though there are many welfare organizations, I don't think there is any organization which can identify and nurture the history makers. If you know any (such organization), please let me know. I am keenly interested in getting in touch with them. Do you have the money and time? Instead of repeatedly creating websites based on stories/politics/cinema, please think of creating a website for history makers. Think of starting an organization too. If ever you can do this, I will consider that itself as the biggest support you are giving to Azhagi. I once again thank Nilacharal (what a beautiful name!) for giving me an opportunity to share my thoughts so very extensively by asking intricate questions. Thank you. Special Note: By God's grace, I am quite fine now, 'relatively'. For more details, read the last section of story.html page. My immensely "hearty" thanks to Shri. V.K. Naageswaran (Chennai) for translating the contents in viewstam.html so that I could provide them to you - as you see above. VKN sir (Shri. V.K. Naageswaran) took only around 9 hours (that too, at a stretch) to complete the entire translation!!! Amazing! A great task accomplished by VKN sir, capturing the essence/feel of the original, to the best extent. Please note that I do have made quite a few changes (in one or other place) in the translation provided to me by VKN sir. So, if in case you personally find the translation above being not appropriate at any place, the fault is ALWAYS entirely mine and definitely NOT VKN sir's. The translation for a few words or sentences might change in the future too. I might do it either on my own or through careful consideration of suggestions from others. This is for the kind information of all those who are reading this page. In 2004, 'Azhagi' software possessed transliteration tools for Tamil language alone. Hence the queries in the interview do not talk about the other Indian languages. Words inside brackets, if in italics, are not part of the original Tamil interview and they have been provided only for the purpose of clarity and better understanding. For the same reasons, links (not present in the original Tamil interview) pointing to wikipedia articles or other web pages have also been provided. "I discovered Azhagi yesterday evening after a Google search 'type in tamil in MS word' and am so delighted to have come across this incredible piece of software. Installation was a snap, the instructions to get one started were so simple that I was able to get to my task with no learning curve. The translation table for Tamil characters on a qwerty keyboard on your main page was enough to help me complete my task well. I was so happy with the software that I wanted to find more about the people behind it. I have no words to tell you how inspired I am by your life and work. My heartfelt thanks to you. Your words of advice in the interview were addressed to youth, they speak clearly to everyone, and I hope to keep them in my heart as I navigate my path. I want to wish you joy, success, long life, but most of all I pray that you'll abide in the turiya jnana state that you are seeking." அன்புடன் மொழிபெயர்ப்பு செய்தவர் திரு. வா.கி. நாகேசுவரன் - 66 வயதிலும் அளவு கடந்த காதல் மோகம் உடையவர் – ஆம், 'அழகியிடம்'! Lovingly translated by Mr. V.K. Naageswaran - one who has unbounded romantic fervor even at 66 – yes, for 'Azhagi'! The aforesaid note is here because Mr. V.K. Naageswaran emailed the same to me and fondly insisted that I have to post it in this page. In his own words (quoting from his email): "If your statements about my translation skills are true, the above is also a matter-of-fact statement and so I would like you to incorporate it in your web upload without any change." Schooling (KG to 5th Std) Kalaimagal Kalvi Nilayam (Erode, TamilNadu), 1972-76. X (10th Std) - 1983, School Topper. XII (12th Std) - 1985, School Topper. B.Tech (in Production Engg. & Management) - 1989, College Topper. P.G.Dip. (in Operations Research) - 1992, Course Topper. Family Wife is working in an established organisation. Son has finished his 12th, from P.S. Senior Secondary School, Mylapore, Chennai.